It got really cold. Dad is wearing a coat rather than his Hawiian shirts. I have to frisk more to keep warm. We hung out at the park this morning. I ran into Tasha and her mom. Tasha's mom calls me "Puppy, puppy, puppy." I like that and I come running when she calls me. 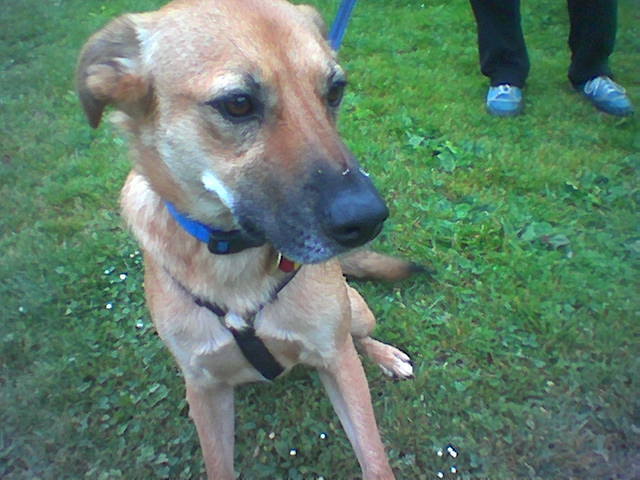 We also hung out with Hoku, a 14 month-old dog who is great to play with. He kept getting the stick out of my mouth. 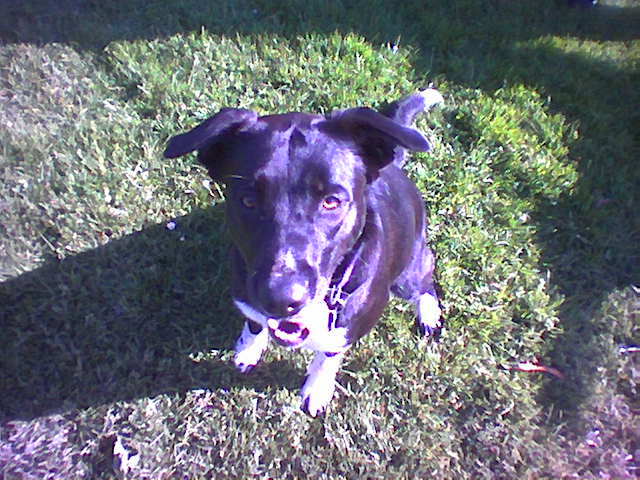 I like getting tired playing with fun dogs like Hoku. We went to the park in the afternoon. I hung out with Pascal. It's Pascal's 5th birthday tomorrow. Reg caught a really fat gopher, but his dad made him let it go. It got back into its hole with no bite-marks. I'm not going to tell the cats... it would only get them upset. We went to the park in the afternoon. At first, there were no dogs and then all of a sudden, all the dogs arrived. I saw most of my favorite dogs. Lola was there. I'm taller than Lola now. She didn't seem interested in playing with me, so I played with other dogs. Dad too me to the park around mid-day. We met a 5 month-old Great Dane. I was as tall as she was. We played. 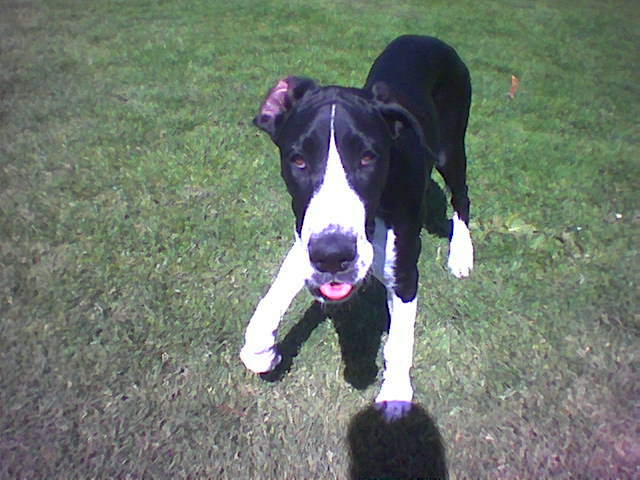 Dad and the Great Dane's mom talked about how I was going to be as big as a horse. Mom and dad went away for the weekend. Lou and her human picked me up. I spent the weekend with Lou. It was lots of fun to see new places, especially along the Russian River. We went to the park. Dad let me off leash just when we got to the park entrance. I ran across the baseball field and ignored dad's calls to me. The lady that takes care of the baseball field yelled at me and at dad. Dad put me on leash for a long time after that. We met Freckles and her mom and her girl. I played with them as well as Niku. Dad left me in the car (with all the windows open) while he went into the food store. I figured out how to use the power seats and got the driver's seat folded all the way down. 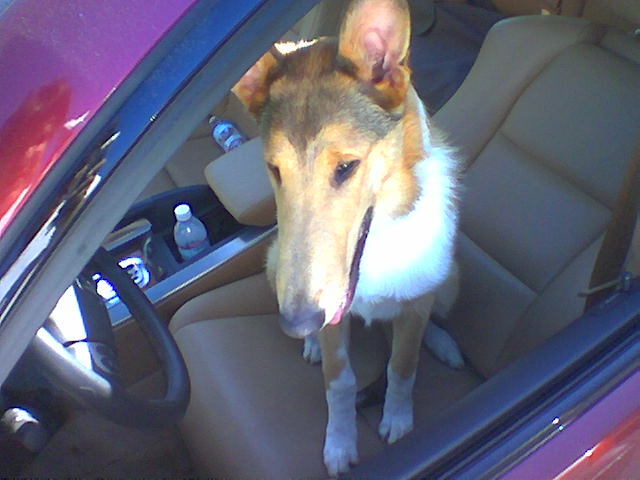 I sat in the driver's seat, but dad wouldn't let me drive. He says I not old enough, but when I get to be 17 years old, we'll apply for a driver's license. He also told me that I can start smoking when I'm 18 years old. It's Cleo's dad's birthday today. We didn't see them, but Happy Birthday Sheldon!! Dad put up a Dogster.com page for me. We were at the park early. 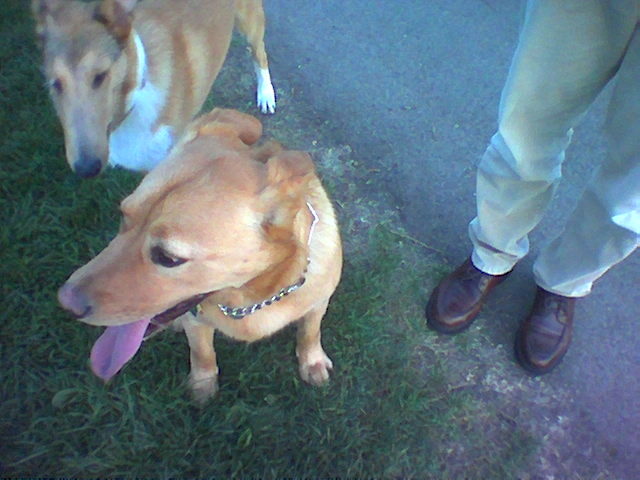 I hung out with Moichi, Macy (who I haven't seen in a while) and Basil. Dad took me to Canvas where he met a friend. 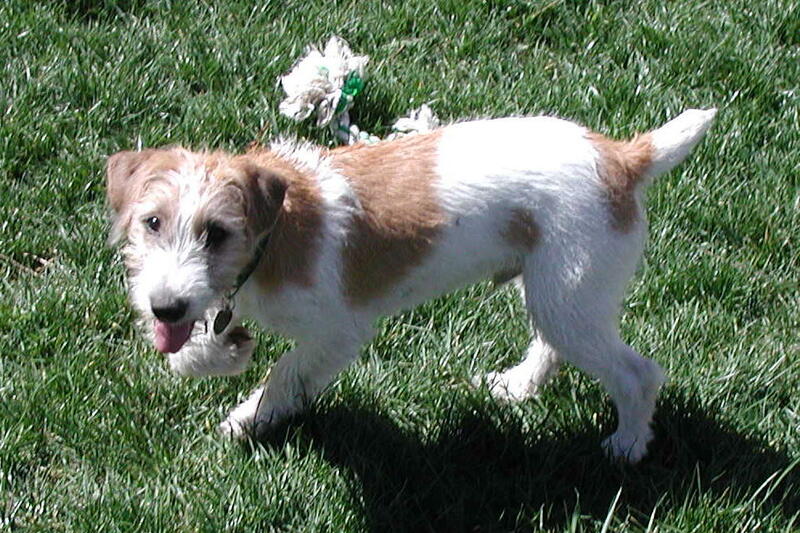 His friend came back to our house with a puppy named Huey (a 4 month-old Jack Russel Terrier) We played in my backyard for hours. 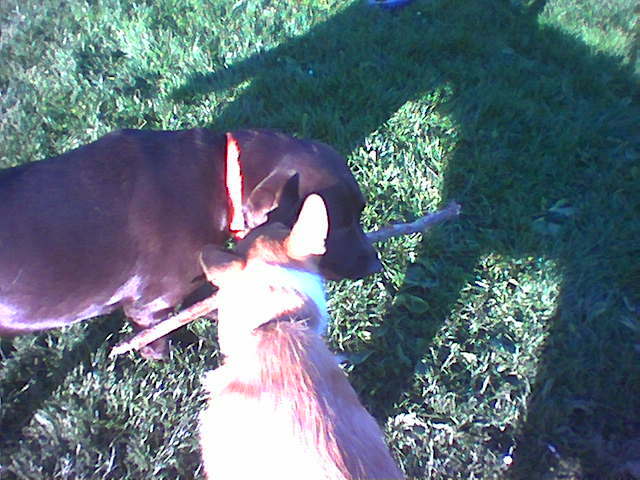 Here's a picture of me with a stick trying to get Huey to chase me. Huey found a gopher-head. I guess those cats killed more than one gopher. Dad put us in our crates when Huey dug a hole to the next yard. Huey and I played all afternoon. He's got a lot of energy. His mom took him home. I want to play with him again. Dad too me to the park. I was pretty tired. I played with Basil. I kept falling down I was so tired. Dad and I walked with Steamer and her mom across the park. Dad told me I had really good recall and gave me lots of treats. 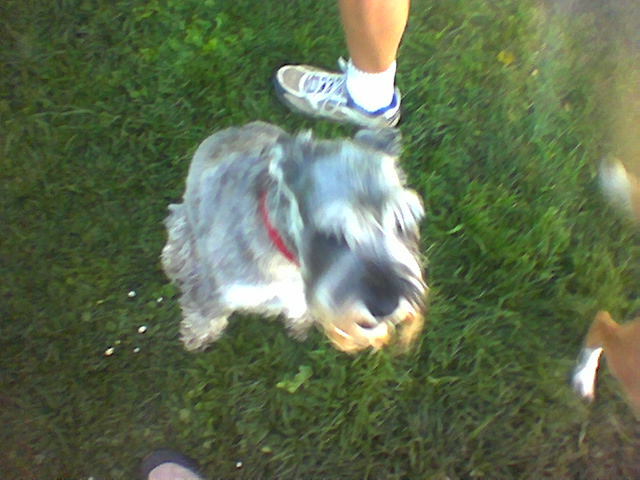 We ran into a new little dog named Millie. Her human gave me a dog baggle and said that she was a professional dog walker and her service was called "Who's Walking Who." The treat was tasty. We went to the park. I met Basil. He's only here for a week. He's a wicked cool dog. We played. Lou and her human took me out in the afternoon. I went to the park in the late afternoon. Basil was back. Monty was there. We tugged on a stick. Moichi was there too. Moichi's fun when you get her going. I got e-mail from Virgil. Yay!! I played with Madeline, one of the cats I live with, a little this morning. She was batting her paw at me, so I did some play-bows and batted back at her. She didn't seem to like the game. Dad took me to the park early this morning. I was being picky about my food, but was really happy to be at the park. It was a dog-o-rama this morning with all my favorite friends. Dad took some pictures. Bosco's dad was really happy about winning a court ruling. 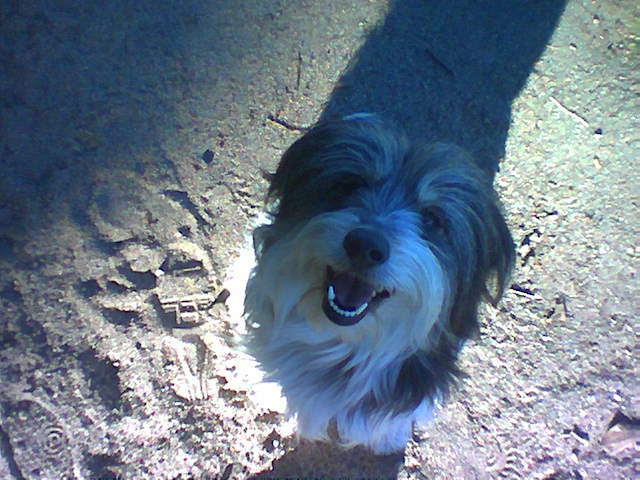 It means that the park not be noisy and dusty and me and my friend can keep playing happily. We went to the park in the afternoon. I was only in the mood to play with Labs. I played tug-the-stick with Higgins. Monty was there too. We all played. I also kissed Higgins' dad who was lying on the ground... that is an invitation for kisses. Cleo was there too. 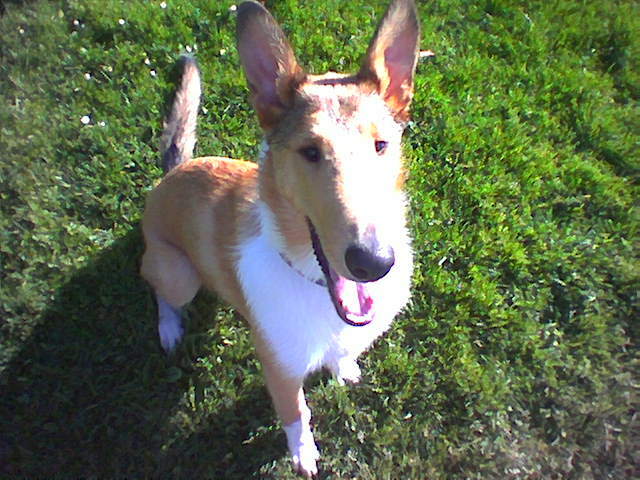 On the way out of the park, a man stopped my dad and asked if I was a Smooth Collie. I am. 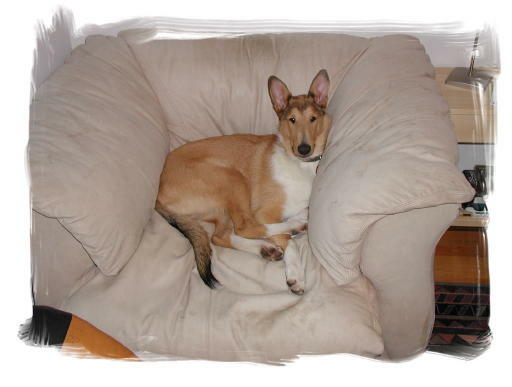 Turns out that the man's dog was a Kelpie which is a mix of Smooth Collie and Dingo. Pretty cool. I was the first dog in the park this morning. I was looking all around for my doggy friends. After a while, they showed up. Freckles and I played a lot. Izzy and Hildy were there, but I didn't feel much like playing with them. 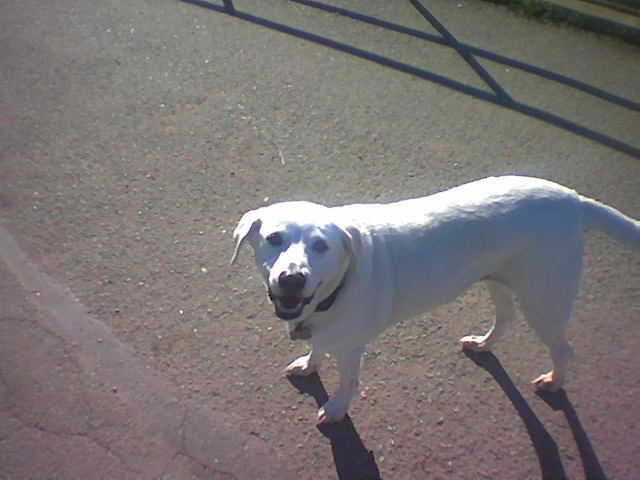 I saw Lola walking up the path into the park. I went over and greeted her. My dad was doing a lot of recall work on me. For some reason, the treats were tasting extra good this morning, so I broke off some play sessions and came to dad when he called. 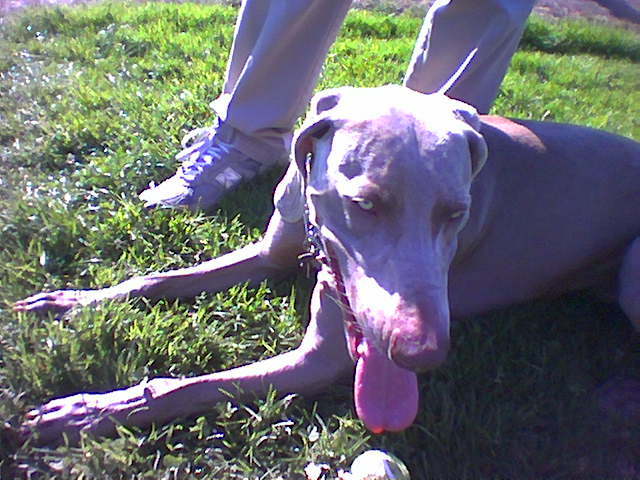 Oscar the Weimaraner was there with him mom. He lost his ball and I tried to help him find it. Okay, I tried to get him to play with me. Dad was talking to Oscar's mom. Seems that dad is allergic to me. Oscar's mom is allergic to him, too. They talked about wiping me with dog wipes and allergy medicines. I got e-mail from Duffy today. Yay!! I found a nice place to snooze. But dad made me sleep downstairs last night because he sneezes and coughs a lot when I'm sleeping in the bedroom. We went to the park in the morning. We say Freckles and Missy. Virgil found another small dog to play with. 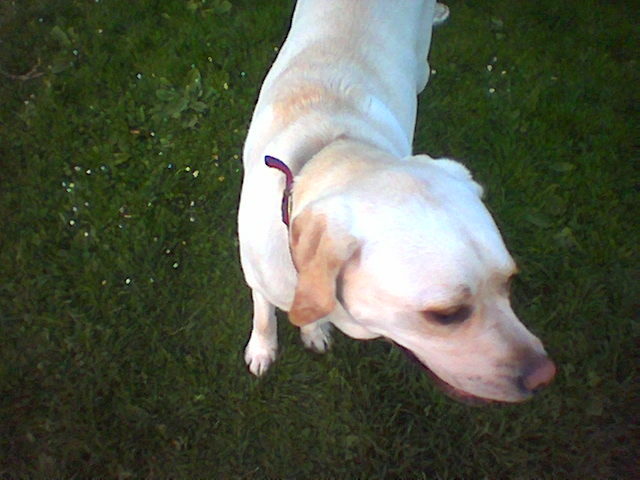 I met two yellow Labradors (a 9 month-old male named Walter and a year-old female named Ellie). We played a lot. 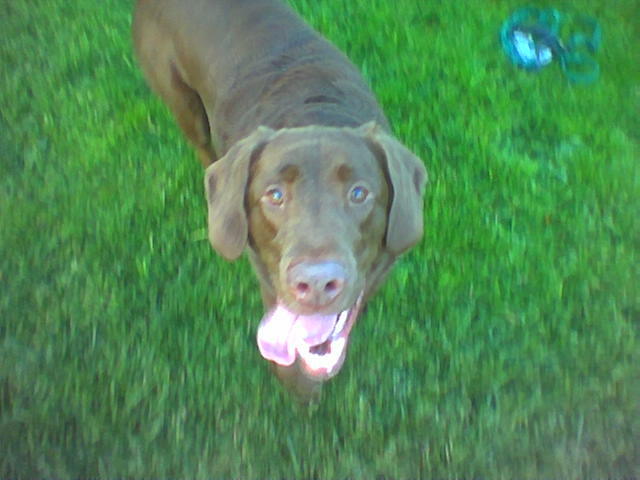 I love playing with Labs. The lady who takes care of the baseball fields talked to my dad and said I look like an ant-eater or a good gopher-catcher because of my long nose. Dad told her the story of the cats catching the gopher. I got my first piece of e-mail today from Steamer. Yay!! I hung out at home this afternoon with my mom and grandma Pat. I like grandma Pat. 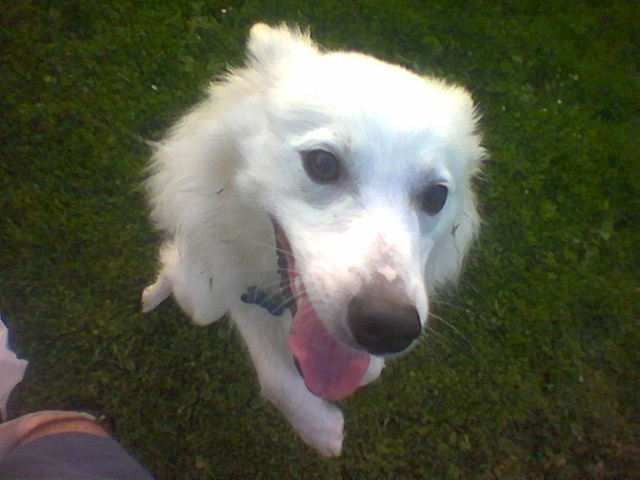 Dad took me to the park in the afternoon. Friday afternoons are great for meeting lots of dogs. 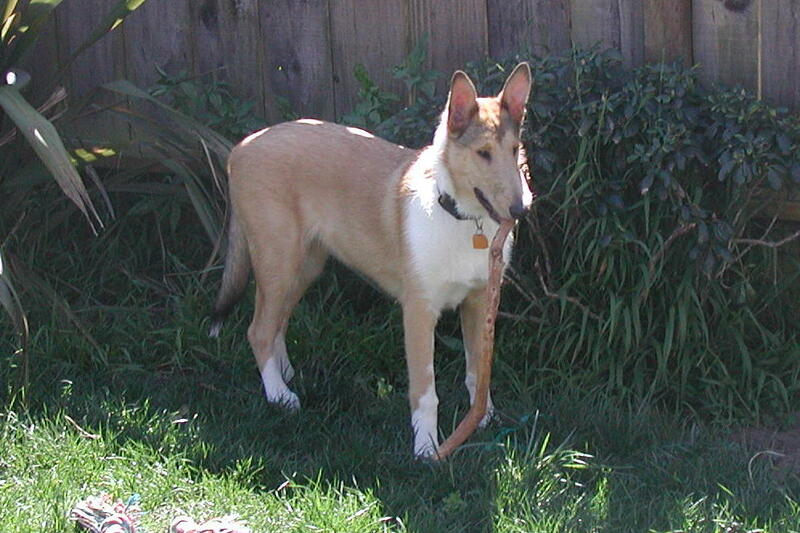 I spent a lot of time playing with Izzy (sister to Hildy -- both German Shepherds.) I showed Izzy some of my new moves. 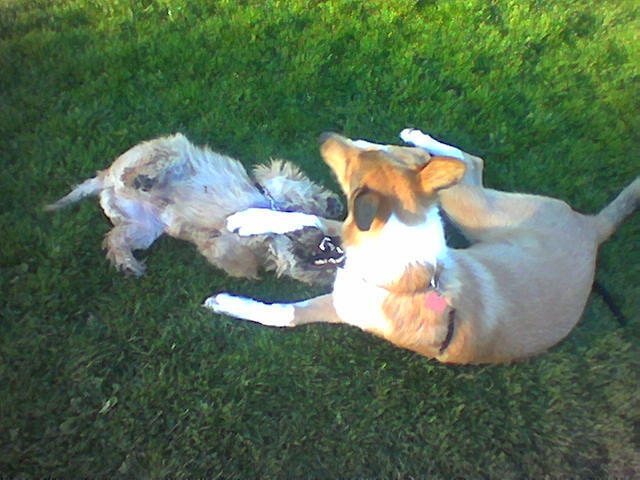 I also played with my friend Duffy. I was really tired by the time we got home. Another beautiful day in San Francisco. Dad took me to the park. I hung out with Freckles for a while. I met a 75 pound dog and we played. My dad said that I'll probably get as big as that dog and have a similar frame. He played really well for a 5 year old, so I'd be happy to be like that dog. We ran into Steamer on the way home. Lou and her human took me out for a short time. I pooped in the car. I don't know why I had an accident. Dad took me out to the park in the afternoon. It was a full-on dog-fest. I hung out with all kinds of dogs. Nugget and Virgil (the Italian Greyhound) did some hard-core frisking. They're well suited size-wise. 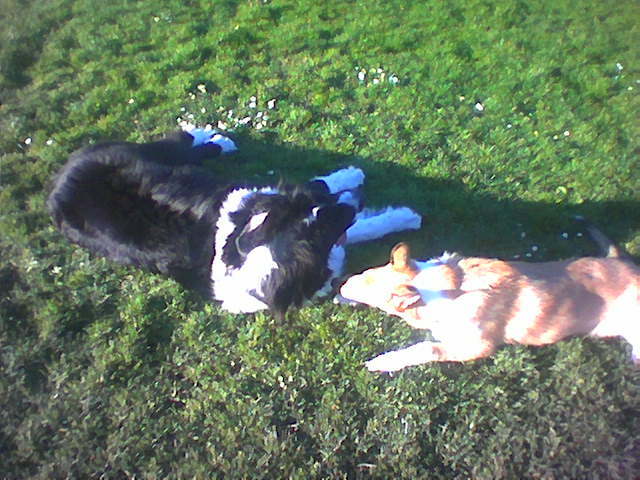 I tried to play with them and even barked at them to let me play, but they were too interested in each other. Virgil gave me some "what-for" and I backed off. Another beautiful day in San Francisco. Mom and dad went out for breakfast without me. Dad weighed me. He said I was 55 pounds. On top of that, dad left without taking me to the park!! Lou and her human took me out for 4 hours. I had lots and lots of fun. I came home tired. The cats (Madeline and Elwood) caught the gopher that was in the backyard. Mom and dad were really happy. They gave the cats lots of treats and said the cats would get Fancy Feast every day for a month. Dad gave me chicken for dinner. I woofed it down! Another beautiful day in San Francisco. Dad and I went to the park. 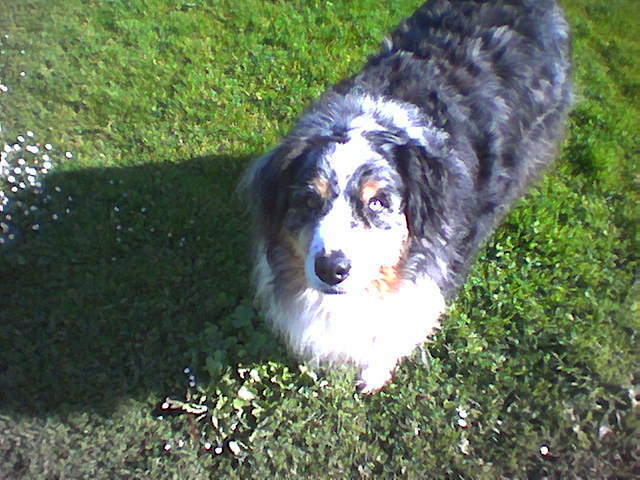 He had an iced coffee and I hung out with Missy the Boxer and Freckles the Australian Shepherd. Much frisking happened. 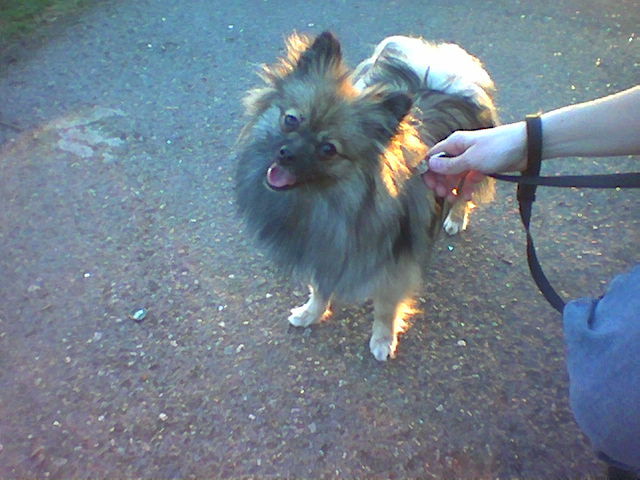 I went out with Lou and her human in the afternoon for 3 hours. I came home tired. An hour later, dad took me to the park again. Most of my friends were there including Lola. Lola and I played. Moo and his friend Cuba came by, but we didn't play that much with them (when I'm with Lola, I just want to play with her.) A Basset Hound named Max tried to get "friendly" with me... it just doesn't work with the two of us guys. Just before we left, we met Nugget, a 5 pound, 5 month-old dog that looked like a Golden Retriever that was shrunk to 1/8th size. It was a really nice day today. It got really warm... 83 degrees in the city. Lots of dogs went to the park today. That made me happy because I met lots of new friends. We went to the park in the morning and I hung out with Pepe. He's a ton of fun and has lots of energy. In the afternoon, we went to the park. It was a dog-o-rama. I met lots of new friends. I met Moo. He's a 10 month old Newfoundland. We played a lot. We also hung out with Duffy, an 11 pound, 8 month-old Cairn Terrier. We all had a good time wrassling... but it was a strange site with 3 dogs, each 40 pounds or more different, playing. Copyright(c) 2004 Archer the Dog. All rights reserved.